Waconia-based vineyard crowned with three Double Gold honors among 6,960 entries from 35 states across the country at San Francisco Chronicle Wine Competition. 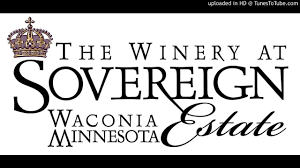 WACONIA, Minn. - Jan. 17, 2018 - PRLog -- The Winery at Sovereign Estate stood alone on top of all other Minnesota vineyards at the San Francisco Chronicle Wine Competition. The Waconia, MN based- vineyard captured honors in six wine categories including Double Gold for the 2016 Marquette, 2015 Reserve Marquette and 2015 La Crescent. Sovereign Estate also won Gold for the 2016 Reserve Marquette, Silver honors for the 2016 La Crescent and Bronze for the 2016 Reserve Frontenac Blanc. The Winery at Sovereign Estate collected more honors than any other MN vineyard. "I am honored that we were recognized by this prestigious competition", said Ben Banks, Wine Maker at Sovereign Estate. "What is also exciting is that we are just in our 8th year and we are progressing every year. I believe that this is only a sign of things to come". Owner Terri Sovereign puts it this way, "This is a clear indication that Minnesota vineyards are capable of producing world class wines . Sovereign Estate is happy to be riding on the crest of that trend". In this annual competition held in January, 2017 in Cloverdale, California, 67 skilled judges from a variety of fields including trade, education, media, retail and hospitality were evaluating wines submitted for entry from across the country. Utilizing an extensive process that divides the varietals into several categories and subcategories, the event gave the panels the chance to rate entries as Bronze, Silver, Gold or "Double Gold" (equivalent to a unanimous rating by all panel judges).